Definition: Diabetes mellitus (DM), commonly referred to as diabetes, is a common disease where there is too much sugar (glucose) floating around in our blood. This occurs because either the pancreas can’t produce enough insulin or the cells in our body have become resistant to insulin. Symptoms of high blood sugar include frequent urination, increased thirst, and increased hunger. If left untreated, diabetes can cause many complications. Acute complications can include diabetic ketoacidosis, hyperosmolar hyperglycemic state, or death. Serious long-term complications include cardiovascular disease, stroke, chronic kidney disease, foot ulcers, and damage to the eyes. There are two main types of diabetes (diabetes mellitus): Type 1 and Type 2 diabetes. Type 1 diabetes (formerly known as insulin-dependent) in which the pancreas fails to produce the insulin which is essential for survival. This form develops most frequently in children and adolescents but is being increasingly noted later in life. Type 2 diabetes (formerly named non-insulin-dependent) which results from the body’s inability to respond properly to the action of insulin produced by the pancreas. It occurs most frequently in adults but is being noted increasingly in adolescents as well. Other types of diabetes might result from pregnancy (gestational diabetes), surgery, use of certain medicines, various illnesses, and other specific causes. 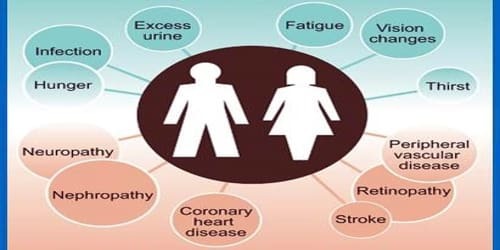 Signs and Symptoms of Diabetes mellitus (DM): The classic symptoms of untreated diabetes are unintended weight loss, polyuria (increased urination), polydipsia (increased thirst), and polyphagia (increased hunger). Symptoms may develop rapidly (weeks or months) in type 1 DM, while they usually develop much more slowly and may be subtle or absent in type 2 DM. People (usually with type 1 DM) may also experience episodes of diabetic ketoacidosis (DKA), a metabolic disturbance characterized by nausea, vomiting, and abdominal pain, the smell of acetone on the breath, deep breathing known as Kussmaul breathing, and in severe cases a decreased level of consciousness. A rare but equally severe possibility is the hyperosmolar hyperglycemic state (HHS), which is more common in type 2 DM and is mainly the result of dehydration. 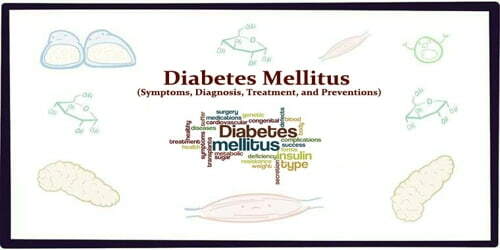 Diagnosis and Treatment of Diabetes mellitus (DM): The disease (Diabetes mellitus) is usually discovered when there are typical symptoms of increased thirst and urination and a clearly elevated blood sugar level. 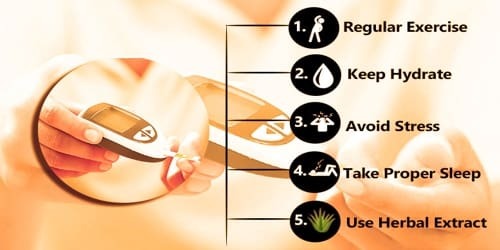 The diagnosis of diabetes is based on the presence of blood glucose concentrations equal to or greater than 126 mg per 100 ml (7.0 mmol per liter) after an overnight fast or on the presence of blood glucose concentrations greater than 200 mg per 100 ml (11.1 mmol per liter) in general. Diabetes is diagnosed with fasting sugar blood tests or with A1c blood tests, also known as glycated hemoglobin tests. A fasting blood sugar test is performed after people have had nothing to eat or drink for at least eight hours. Normal fasting blood sugar is less than 100 mg/dl (5.6 mmol/l). People do not have to be fasting for an A1c blood test. According to the current definition, two fasting glucose measurements above 7.0 mmol/l (126 mg/dl) is considered diagnostic for diabetes mellitus. 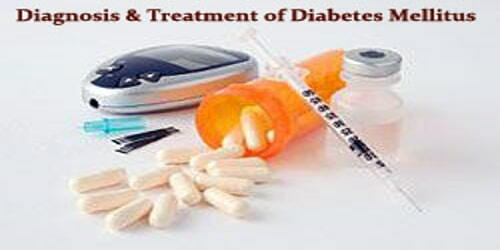 Treatment for diabetes mellitus is aimed at reducing blood glucose concentrations to normal levels. The only effective treatment in type 1 diabetes is administering insulin as these patients no longer produce it. Newer treatment regimens include the use of an insulin pump where blood glucose levels are entered into a machine which then uses an algorithm to pump insulin into the body. Type 2 diabetics have more options. Initial therapy for type 2 diabetics with mild disease is lifestyle modification: a healthy diet with exercise to help lose weight. There are several classes of oral drugs used to control blood glucose levels, including sulfonylureas, biguanides, and thiazolidinediones. All patients with diabetes mellitus, particularly those taking insulin, should measure blood glucose concentrations periodically at home, especially when they have symptoms of hypoglycemia. This is done by pricking a finger, obtaining a drop of blood, and using an instrument called a glucometer to measure the blood glucose concentration. Preventions of Diabetes mellitus (DM): There is no known preventive measure for type 1 diabetes. Type 2 diabetes – which accounts for 85–90% of all cases – can often be prevented or delayed by maintaining a normal body weight, engaging in physical activity, and consuming a healthy diet. Higher levels of physical activity (more than 90 minutes per day) reduce the risk of diabetes by 28%. Diabetes is a serious and costly disease which is becoming increasingly common, especially in developing countries and disadvantaged minorities. However, there are ways of preventing it and/or controlling its progress. Public and professional awareness of the risk factors for and symptoms of diabetes is an important step towards its prevention and control.